If there’s one industry that could be described as engaged in a battle to the death for sales it’s the energy sector. How does Dr Johannes Teyssen, Chief Executive and Chairman of Germany’s E.ON, react to this relentless competition? He encourages customers, both industrial and domestic, to reduce energy consumption and in the process to lower their power bills. It’s a strategy that’s guaranteed, one would think, to reduce profits as well. Not so, insists Dr. Teyssen. Although some analysts argue that E.ON is cutting its own throat, the unconcerned chief executive explains it’s just good business. His thinking goes like this: As the power-supply infrastructure fragments into ever-smaller units such as smart grids that harness, store and distribute energy supplied by the E.ONs of this world, grateful power-users will spread the word to a whole new wave of clients. Namely, that the German firm is committed to saving them money as well as the planet. “These customers end up by selling energy on our behalf,” argues Dr. Teyssen. Like other energy giants, E.ON is very much in a state of transition. A long-term employee of the group, Dr. Teyssen took over the Dusseldorf-based company in the spring of 2010 in the middle of something of a crisis. Although Germany is recovering from the European-wide recession surprisingly quickly, pushing up E.ON’s domestic earnings, the company remains exposed to a number of weak economies, notably Spain, Italy and France. Demand for energy was slumping, resulting in lower power prices, slimmer margins and excess capacity. The result? E.ON had to write off €2.6bn on operations in those three countries alone. 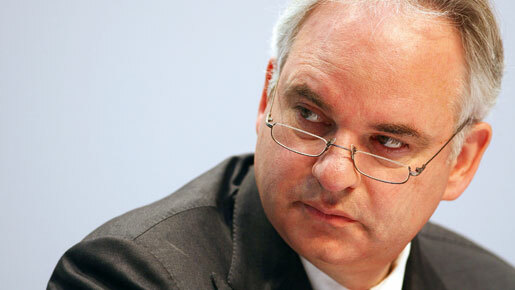 If nothing else, Europe’s troubles confirmed the new chief executive of the validity of his broad strategy for E.ON. The road forward is to do more with less. It’s not however easy to change an elephant’s direction in a hurry. Just ten years old in its present form, E.ON is a mammoth operation by any standards, indeed one of the biggest investor-owned energy companies in the world. For the first nine months of 2010, adjusted EBIT (Earnings before interest and taxes) – E.ON’s preferred earnings figure – was €8bn and net income €3.78bn. In a full year E.ON invests about €7bn. It boasts an 85,000-strong staff, over three times the number at Shell and 5,000 more than BP. (E.ON’s mission statement has rejected “greener” in favour of “cleaner” because, the boss argues, it’s more relevant.) Fine words perhaps, but E.ON’s declared goals appear to support the rhetoric. The company has adopted a strategy of halving its own carbon emissions by 2030 compared with 1990 levels, ten years ahead of schedule. And in renewables-based energy, E.ON is one of the pace-setters. More than half of all offshore wind-powered turbines installed around the world in 2010 bear the E.ON logo. And sun-generated heat is poised to follow suit – by 2013 the firm’s solar-powered capacity will match that of wind power today. In total, at the end of 2010, the installed capacity of E.ON’s wind, solar and biomass facilities stood at nearly 4,000 megawatts, 10 times what it was just three years ago. The €6bn poured into renewables in those three years is based on hard figures rather than on mere idealism. Under Dr. Teyssen’s strict rules for all capital expenditure, E.ON’s offshore wind farms and gas-fired generating units – another important plank of the firm’s long-term strategy – are required to earn a precise 1.5 percent more than their cost of capital. E.ON’s new boss is not an oil man. Grey-haired and chubby-cheeked, he’s a specialist in energy law whose expertise helps the firm negotiate its way through an increasingly stringent regulatory environment and the public scrutiny that goes with the climate-change debate. And as BP knows to its considerable cost from the Deepwater Horizon disaster, all energy companies are highly exposed to long-running litigation from many sources. E.ON is no exception. In America it’s still batting off lawsuits relating to the disposal a decade ago of Veba Electronics. And although it’s just paid a fine of €553m to the European Commission in a disputed case over allegations of market-sharing between subsidiary E.ON Ruhrgas and GdF Suez, the firm acknowledges it could face further lawsuits on the same issue. Yet while they may be popular legal targets, energy giants keep the economy going and people warm. For instance, E.ON’s flagship project to build a hard coal-fired facility in the Westphalian city of Datteln, which is also the object of legal challenges, will eventually provide the power for nearly half of Germany’s entire rail network, including the high-speed ICE trains, as well as for 100,000 homes in the Ruhr area. But back to doing less with more. Dr. Teyssen is a believer in lean as well as clean energy. Under the slogan “Perform to Win”, he’s busy selling off assets deemed surplus. “We need to grow by deploying our expertise and less by deploying ever-increasing amounts of capital,” he says. So saying, in December he quit a 3.7 percent stake in Russia’s Gazprom for €3.4bn to book a gain of €2.4bn, an important step on his grand plan to unload €15bn in assets within the next three years. Simultaneously he’s busy chopping €1.5bn a year out of operating costs. To adapt the title of a popular economics book of the seventies, even in energy giants, smaller may be beautiful.